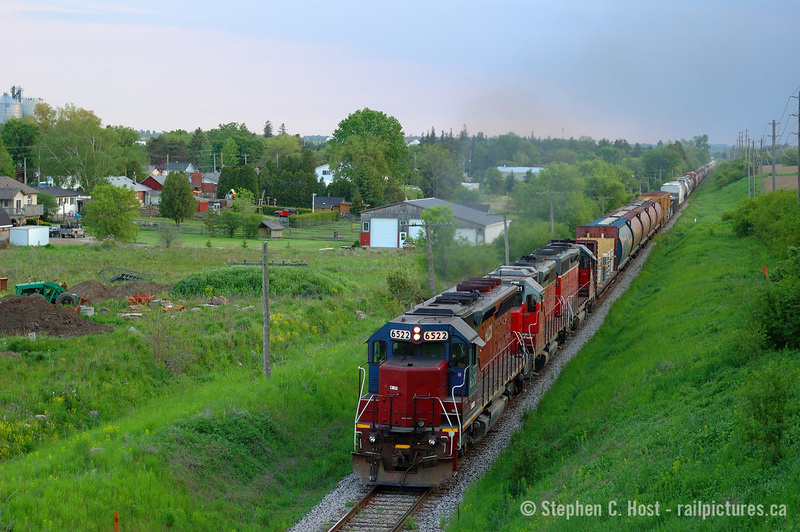 Railpictures.ca - Stephen C. Host Photo: This is an era of GEXR that was not often photographed, as they ran at night. Also, I wasn’t a huge fan of the motive power, but I was able to get a couple photos here and there. Outside of locals, photos of 432/1 from the darkness era 2008 to what, 2012? are hard to come by due to the night ops, also an eastbound at dinner was photography hell as you’d be shooting into the sun. Imagine my surprise when I found this in my archives, it’s not that half bad! Around the time of G&W Takeover 432/1 returned to daylight and ran in perfect timeslots for photography, and still does. This photo was taken at 8:31 PM from Jones Baseline Rd. At least we have the right leader, Built in 1968 as DRGW 5334 as a SD45, rebuilt as an EMD SD40M-3, HLCX 6522 leads 3821 and 4019 on 432 just outside of the City of Guelph. Photo notes: Nikon D70, 50mm fixed lens at f/2.5 to keep the shutter speed fast in rapidly failing light. | Railpictures.ca – Canadian Railway Photography – photographie ferroviaire Canadienne. Caption: This is an era of GEXR that was not often photographed, as they ran at night. Also, I wasn't a huge fan of the motive power, but I was able to get a couple photos here and there. Outside of locals, photos of 432/1 from the darkness era 2008 to what, 2012? are hard to come by due to the night ops, also an eastbound at dinner was photography hell as you'd be shooting into the sun. Imagine my surprise when I found this in my archives, it's not that half bad! Around the time of G&W Takeover 432/1 returned to daylight and ran in perfect timeslots for photography, and still does. This photo was taken at 8:31 PM from Jones Baseline Rd. At least we have the right leader, Built in 1968 as DRGW 5334 as a SD45, rebuilt as an EMD SD40M-3, HLCX 6522, 3821 and 4019 on 432 just outside of the City of Guelph. Photo notes: Nikon D70, 50mm fixed lens at f/2.5 to keep the shutter speed fast in rapidly failing light. They would usually meet VIA 87 in Kitchener during this era and then depart for Mac Yard after completing their switching in the yard. Done and done RLK2211. GEXR certainly got out of mac much faster 10-15 years ago. 581 and 432/431 pooled the power for a couple years, 432 was back in the 05:00 slot in 2010, and was always at the mercy of of Mac Yard . Great shot Stephen, better get your shots of daytime trains there now! Not entirely weird. I believe the operating plan was to use the same power set to Goderich and Toronto. so 581 to Goderich during the day and 432/1 to Toronto. That obviously changed under G&W. 431 would return thru Guelph about 4 to 5 hours later and even sooner in early 2000′s as I remember. Nice Steve. I remember those engines. I have only a few shots of them when it was coupled with its sister in the same paint scheme. Yeah that was a weird hour for 432 to run. I’m assuming 431 was overnight or early morning back then? Nice! I remember a westbound around 8pm like clockwork for awhile in 2007-2008. Must have been just before night operations. Lots of geeps. Usually 6-7 but I remember 8 one night.